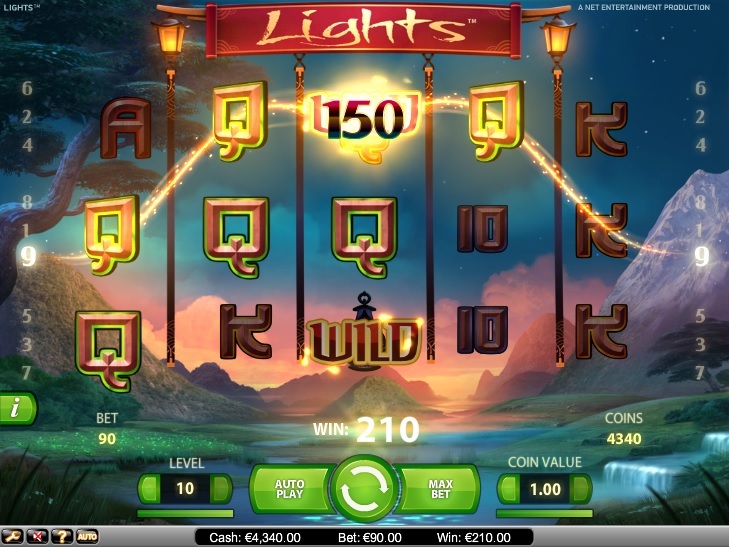 Lights, one of the most beautiful slots ever created by Net Entertainment (NetEnt), is based on the Asian theme with a special focus on fireflies. The slot offers stacked symbols, floating wilds, and up to 30 free spins. NetEnt’s Lights slot comes with 9 paylines and players can activate as many or as few of them as they please. Players can bet up to 10 coins for each payline they activate and choose from coin values that range from $0.01 to $1.00. If players hit the Bet Max button, they will be betting the maximum of $90.00 per spin of the reels. Once players have placed their bets, they can hit the Spin button to set the reels spinning. They will get paid if a winning combination is displayed on the reels at the end of a spin. If no winning combination is displayed, players can place another bet and try again. The slot comes with features such as Autoplay and Skill Stop. While the former allows players to spin the reels automatically, the latter allows players to stop the spinning reels, catch hold of a winning combination, and win more prizes. Lights is one of the loveliest slots in the NetEnt portfolio, featuring beautiful graphics and realistic audio effects. Whenever players spin the reels of this slot, they will be treated to the sight of brilliant fireflies flitting across the reels. The slot is based on the theme of fireflies and the reels are set against the backdrop of an Asian landscape soaking in the light of the setting sun. In keeping with its Asian theme, the slot features brilliantly lit lanterns of different colors. There are red lanterns, green lanterns, orange lanterns, purple lanterns, and blue lanterns in the midst of high-value playing cards. The symbols across the reels of Lights slot can appear in the form of stacks of up to three each and increase players’ chances of winning payouts. But the most special feature of Lights is its floating wild symbol, which can substitute for all other symbols across the reels except the Fireflies scatter symbols. Whenever players spin the reels of this slot, two to four floating wild symbols appear at random. When the free spins round is being played, three to six floating wilds can appear at random on the reels. If players land three, four, or five Fireflies symbols anywhere on the reels, the free spin round gets activated and players will get 10, 20, or 30 free spins, respectively. This feature can be re-activated while playing a free spin. Lights slot is worth playing not just for its beautiful, unique theme, but also for special bonus features that allow players to win much more than the top fixed jackpot of 1000 coins.